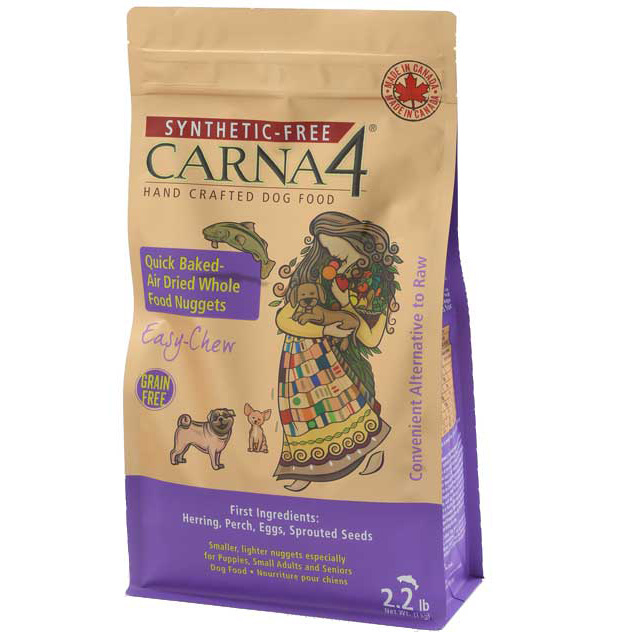 Carna4 is 100% real food grown only on Canadian and American farms and in our coastal waters. Carna4 is the first to use the powerful, natural antioxidants & nutrition of SPROUTED SEEDS to provide only whole-food nutrition. Carna4 is real food made to look like kibble. 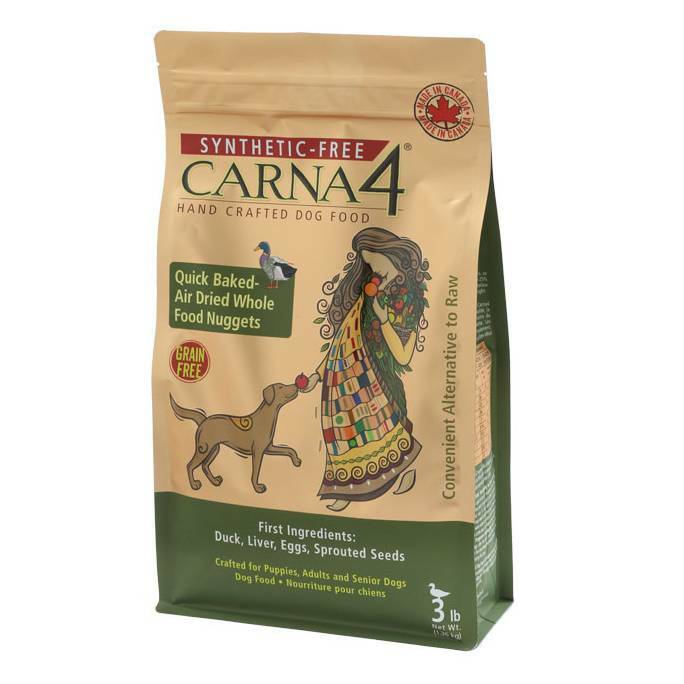 Carna4 is “The Unkibble”. 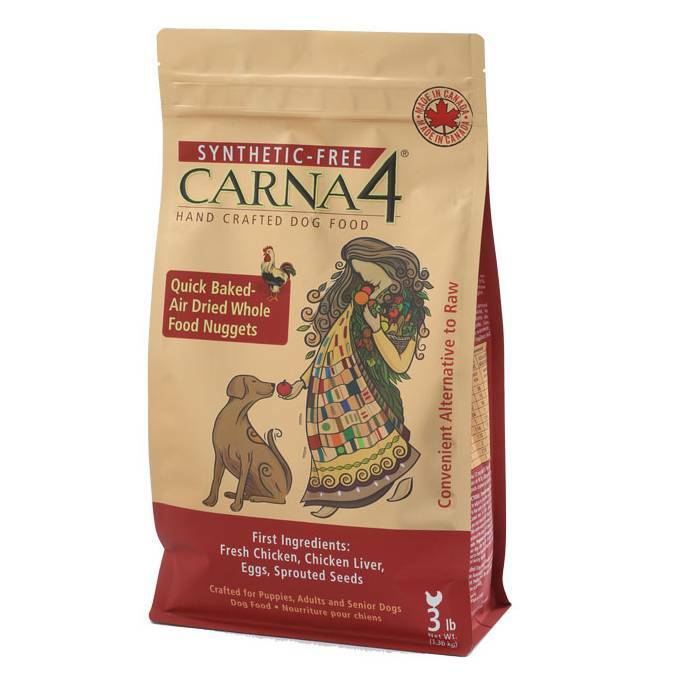 A great option for owners who keep trying different foods without seeing desired results. -Quick bake + air dried – similar nutrient preservation as “dehydrated” pet foods. or if you just don’t want to put the effort into home preparation. a synthetic pre-mix. Authentic nutrition is more bioavailable. -100% of ingredients are foods grown in Canada and U.S.A.
fussy eaters – and it tastes great! plus over 64 essential nutrients. Chicken: Fresh Chicken, Chicken Liver, Eggs, Ground Organic Sprouted Barley Seed, Salmon, Sweet Potato, Ground Whole Brown Rice, Ground Organic Sprouted Flaxseed, Ground Organic Sprouted Lentils, Ground Organic Sprouted Peas, Potato Starch, Apples, Carrots, Sea Salt, Kelp. Duck: Duck, Pork Liver, Eggs, Ground Organic Sprouted Barley Seed, Herring, Ground Fava Beans, Sweet Potato, Ground Organic Sprouted Flaxseed, Ground Organic Sprouted Lentils, Ground Organic Sprouted Peas, Potato Starch, Apples, Carrots, Sea Salt, Kelp. Fish (Easy-Chew) - only available in 2.2lb or 4.4lb: Herring, Perch, Eggs, Ground Organic Sprouted Barley Seed, Salmon, Ground Fava Beans, Sweet Potato, Ground Organic Sprouted Flaxseed, Ground Organic Sprouted Lentils, Ground Organic Sprouted Peas, Potato Starch, Apples, Carrots, Salt, Kelp, Baking Soda.